Photo shows 'DX' 0-6-0 no. 1773 (built in October 1870) decorated for some sort of special occasion, perhaps sometime in the 1880s. On the leading splasher is the legend: 'SUCCESS ATTENDS PLACE'; on the centre splasher is: 'PATIENCE AND PERSEVERANCE' and below the numberplate is 'SPRINGS BRANCH'. What is written on the banner above the numberplate is not legible unfortunately. Can anyone give details of what the occasion was? The last word on the leading splasher is surely 'PLUCK' - so the legend presumably refers to the three Precedents built in March 1875, nos. 2178/9/80 (Crewe Motion nos. 1905/6/7). 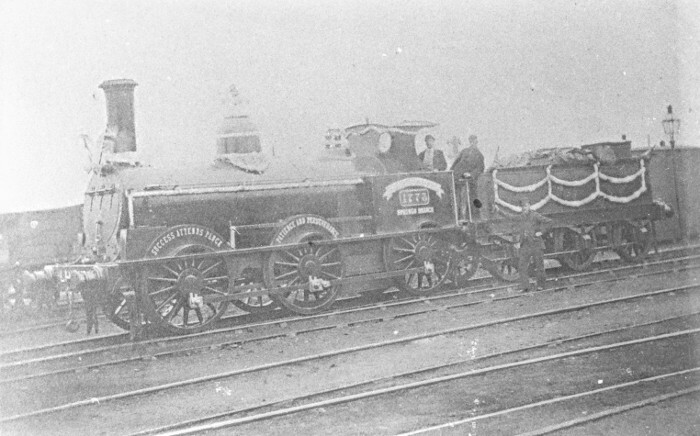 All three engines were shedded at Liverpool in the late 1870s, but what they may have accomplished to promote this rejoicing at Springs Branch, I do not know. Well done, Harry! I have looked again at the photo and though I cannot be sure � it�s a rather poor print - the last word could certainly be PLUCK. Looking at plate 67 in Ted Talbot's LNWR Miscellany showing a Precedent decorated for Rugby Shed Trip I wonder if this was perhaps a similar occasion at Springs Branch.